Martyn Hilbert's Railway Photography - Branch Lines - 20902 & 20905 at Cocker Bar, Ormskirk Line. 20902 & 20905 at Cocker Bar, Ormskirk Line. Up with the Lark! 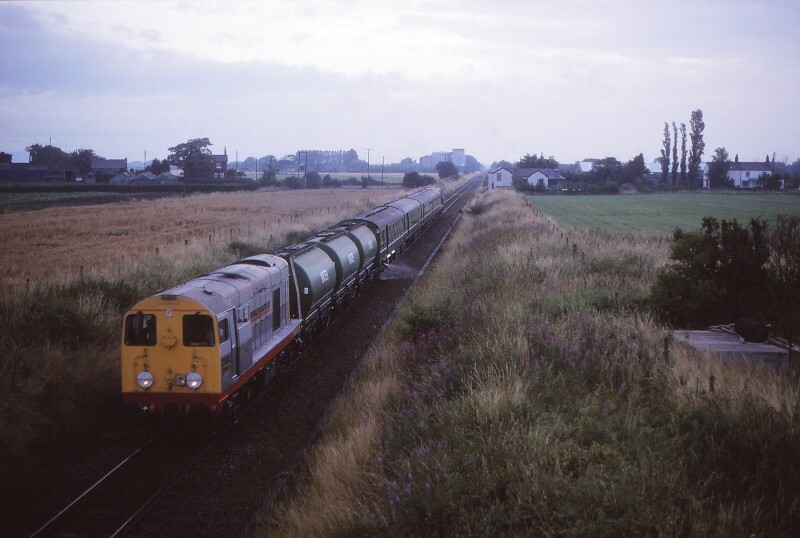 At 5.30am on the 30th July 1990, Hunslet-Barclay liveried class 20s, 20902 & 20905 top & tail a weed control train spraying the trackside at Cocker Bar on the Preston to Ormskirk Line. In the background is Midge Hall, the train has just passed over Pages Occupation Crossing. The train was running ahead of the first service train. Not the best of images - but Kodachrome 64 was struggling at this time of the morning!